The studiy programme of the PIER Helmholtz Graduate School meets the qualification requirements of the PhD programme of the MIN Faculty of Universität Hamburg. Doctoral students who successfully complete the study programme of the PIER Helmholtz Graduate School receive a certificate and a transcript of records. The effort of the study programme is calculated on the basis of semester hours according to the requirements of Universität Hamburg. The previous, credit point-based calculation was replaced by a semester hour-based calculation in 2015. The workload is the same. 1 semester hour = 15 x 45 minute sessions. The calculation of semester hours includes the workload for lectures, posters, etc. Block seminars: 1 day = 0.5 semester hour, 2 days = 1 semester hour, etc. Half-day block seminars can also be credited. Block courses are credited with a maximum of 10 days / 5 semester hours. Language courses: the provider fixes the amount of semester hours. Courses at PIER Helmholtz Graduate School: 2 semester hours. Participation in master modules of Universität Hamburg: Semester hours as accredited by the university. The nature of the course work performance (Studienleistungen) is defined at the beginning of the course by the lecturer. Lecturers can credit additional individual effort of doctoral students with additional work or semester hours. Own teaching at the university can be credited with a maximum of 2 semester hours in the area key competences (C). Semester hours are usually fixed by the organiser. If this is not the case, the PIER Helmholtz Graduate School’s management committee defines a semester hour equivalent. A written confirmation of attendance by the organiser, lecturer or supervisor is required for each course/workshop/conference. Doctoral students are asked to upload each attendance confirmation in the PIER database. Various interdisciplinary events in the PIER research fields provide participants with the basis for lively scientific discourse. The spectrum of events ranges from cross-curricular doctoral seminars that the participants organise themselves to interdisciplinary lecture weeks. PIER PhD seminar by and for doctoral candidates: The event provides participants with a forum for interdisciplinary scientific discourse and for networking within the PIER research fields. Every participant holds a presentation about his or her main research field. The interdisciplinary nature of the event means that participants are faced with the challenge of communicating their research activities to a non-specialist audience. Regular interdisciplinary events at the PIER Helmholtz Graduate School: Interdisciplinary workshops in the PIER research fields are offered to the doctoral candidates during the PIER Annual Retreat, PIER Lecture Week and PIER Symposium. Innovative events in which doctoral candidates learn to communicate their research fields to a non-specialist audience: e.g. Science Slam, Scientific Speed Dating. Doctoral candidates receive financial support for participation in interdisciplinary events that are subject to a fee or are held outside Hamburg. Doctoral candidates receive financial support to organise/hold interdisciplinary events/workshops. Doctoral candidates receive financial support from the PIER Idea Fund. The fund helps doctoral candidates find, try out, enhance and implement new research and development ideas in the four PIER research fields. The third PHGS pillar is support. Optimal scientific support is crucial for enabling doctoral candidates to complete their dissertations quickly and successfully. Extracurricular services concerning career planning and social networking also help participants successfully complete their dissertations and embark smoothly on their careers. 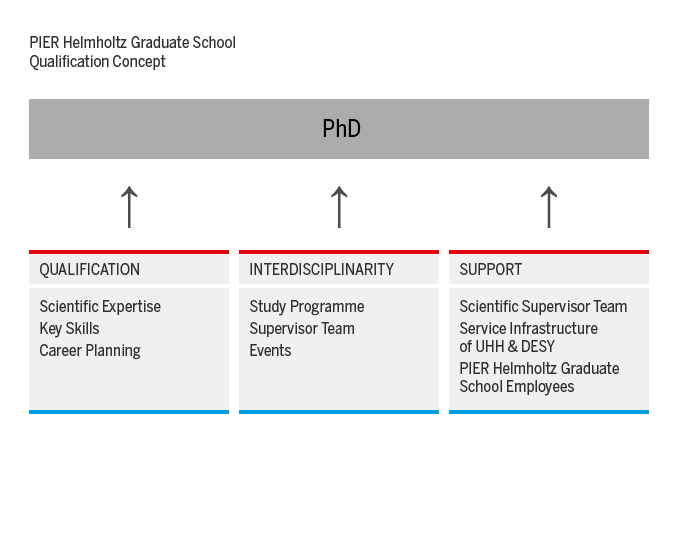 At the PIER Helmholtz Graduate School, every doctoral candidate is supported by a team of supervisors. The team consists of a primary supervisor (from the research field in which the dissertation is being written) and at least one secondary supervisor (from another PIER research field, if possible). The formal conditions for supervision are defined in the respective Doctoral Degree Regulations of the University where the PhD student is admitted. For PhD students at University of Hamburg the Doctoral Degree Regulations of the Faculty for Mathematics, Informatics and Natural Sciences apply. The formal conditions that a supervisor has to fulfil are specified in §6 (3): At least one supervisor must be a full-time professor or `habilitated´ member with an employment in the MIN faculty. In accordance with §4, a panel of supervisors, consisting of three people including a chair, a supervisor and a co-supervisor, can be appointed upon recommendation of the applicant as well. The supervisors can also make agreements with the doctoral candidate about other issues such as further training and education, career planning assistance, conflict resolution etc. A wide variety of career development offers, ranging from career orientation at job seminars with alumni from the various research fields to workshops that are especially tailored to the needs of doctoral candidates and taught by highly qualified instructors. Provision of an overview and contacts with all service providers and services for doctoral candidates. This is done in cooperation with established facilities at DESY, Universität Hamburg and the city of Hamburg. Organisation of joint leisure activities in cooperation with the representatives of the doctoral candidates. A separate buddy programme for new doctoral candidates. The PIER Helmholtz Graduate School office serves as a mediator and point of contact for resolving conflicts.